Description: Weighing up to 4kg (8.5lbs), striped skunks have a dark brown to black coat with a characteristic white stripe that typically begins above their nose, splits into a double line along the back and rejoins on the bushy tail. Skunks have a short, pointed face, a blunt nose, short legs with long, tough claws and their tail can be 1/2 to 3/4 of their body length. As they age, the white stripe on many skunks turns yellowish and some striped skunks also have white patches on their legs or interruptions in their white stripe. 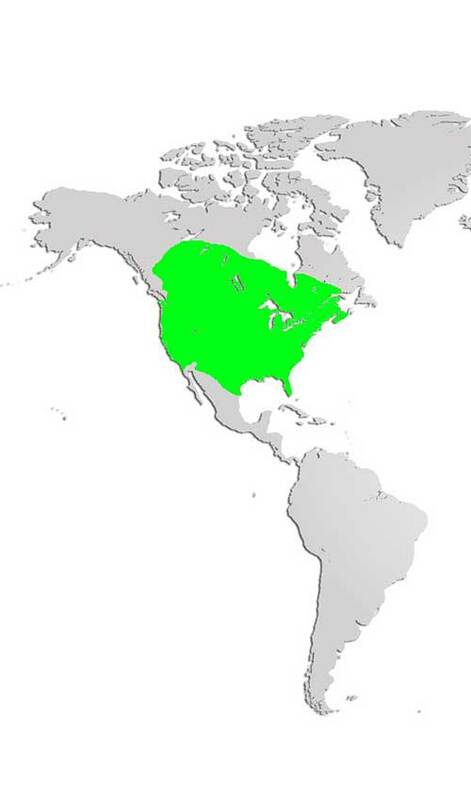 Distribution and Habitat: Striped skunks are the most common skunk in North America. Found abundantly throughout Canada below the arctic tree-line, with exceptions for many islands, their range extends as far south as Mexico. Skunks are very adaptable and although they prefer a habitat of mixed forest and grassland, they quickly become established around human settlements, denning under porches and hunting on lawns. Diet: Omnivores, striped skunks are opportunistic eaters, taking advantage of what is to be found in their habitat area and varying their diet according to the seasons. Insects, both larvae and adults, form the bulk of the striped skunk diet, with eggs, birds, small mammals, amphibians and carrion, plus berries, fruit, leaves and sometimes mushrooms, all eaten as they are encountered during the skunks nocturnal foraging. Life Cycle: Skunks are not true hibernators, although they may den up and enter a state of deep sleep (torpor) for several days during very cold weather. Usually solitary, skunks meet up to mate in February/March and litters of 4-7 blind and hairless young (kits or pups) are born 60 days later. Hair growth is rapid and the eyes of the young open within 2 weeks. Although capable of releasing musk at an early age, young skunks will typically run for safety rather than spray, allowing their mother to defend them. Males aggressively fight for female attention but do not use their musk as a weapon against each other. Young striped skunks usually disperse from their maternal family unit in the early fall but some may spend their first winter sharing a den with their mother. Skunks are excellent diggers but prefer to use abandoned underground or otherwise protected dens from other animals, especially groundhogs. Striped skunks have few natural predators other than great horned owls who are not deterred by the musk. Adaptations: Skunks are best known for their ability to spray a supremely foul-smelling musk from two glands near the base of their tail. This thick, yellow liquid effectively deters most predators, including humans, and can be temporarily blinding, allowing the skunk to scurry away to safety. The scent glands of striped skunks contain enough musk for 5-7 squirts, each release reaching distances up to 2.5m (10ft). Skunks do not spray without careful consideration, displaying several warning signs such as hissing, growling, foot stomping and tail raising before looking back over their shoulder for specific aim and forcefully ejecting their musk. Other than their musk and sharp teeth, skinks have few defenses; they are slow moving, not very agile, and cannot climb although they are capable of swimming. Did you know? The striped skunks found at the park have had their scent glands removed, so they cannot spray. However, they are not pets and will bite if given the opportunity – to an insect eater like a striped skunk, little human fingers look just like worms.